Complete equine health care requires routine dental care. At Henderson Equine, we can provide motorized dentistry at your farm or at the clinic. Motorized dentistry is faster and often more thorough than traditional "hand floats". We do sedate the horses for this procedure, which helps to alleviate anxiety (in horses, vets and owners!). The sedatives are tolerated well and are very safe. Most horses need a dental once yearly, but some special cases need to be evaluated and adjusted more frequently. The only way to truely evaluate your horse's need for dentistry is to open the mouth with a speculum - this allows us to visually and manually inspect the teeth. Equine teeth grow by slow, continous eruption throughout their lives. 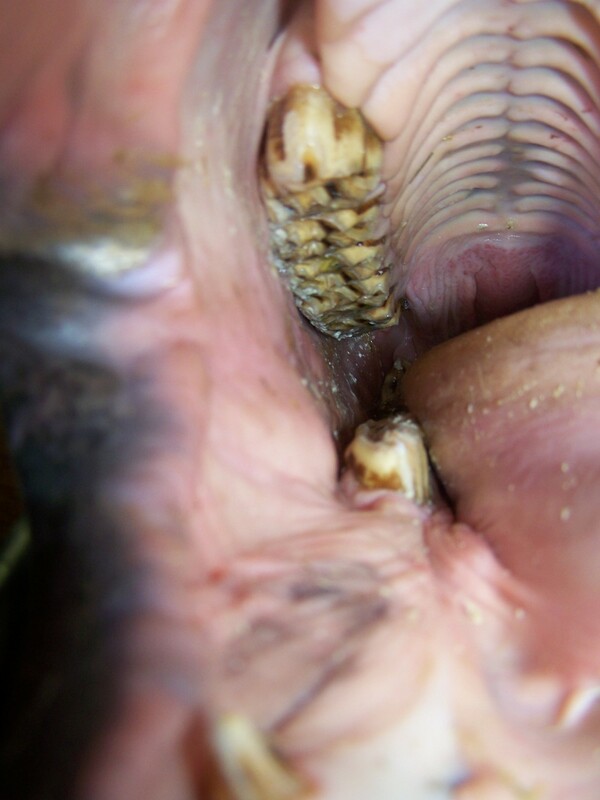 These teeth are naturally worn down by the normal circular chewing pattern of horses. This motion, moving the jaw front to back and side to side with each chew, aids in the grinding of food and wears down the premolar and molar teeth. If this motion is impeded, the teeth begin to wear abnormally and dental problems result worsening with each year of tooth growth. Dental filing, called floating, will manually reduce the irregular wear, keeping the dental arcade and new tooth eruption level. A level dental archade is important for the comfort of your horse and his or her ability to eat properly. If routine dental care is performed throughout a horse's life, the dental arcade will remain balanced into old age. This will allow your horse to comfortably chew and thus maintain his health and weight. The reverse is also true; if teeth are neglected, the dental abnormalities worsen with age, affecting comfort, health, and weight. With time, this will requiring drastic and frequent correction to keep the horse healthy. Common signs of dental problems under saddle are resisting or refusing to take the bit, head shaking, high head carriage or bucking under tack, resisting collection. Horses with dental problems may also spill grain while eating, twist their head to one side, or drop half chewed wads of hay ("Quidding"). Often the last sign to appear is losing weight. While the incisors may be checked for abnormalities by raising the upper lips, the molars extend too far back in the mouth, and are hidden by the tongue to be adequately checked without a speculum. Although it brings to mind images of middle age iron maidens, it is not uncomfortable for the horse and many will tolerate it very well. The speculum is required to allow access to the back molars. Floating molars without a full mouth speculum ensures the back molars are not being filed and prevents a feel of the molars to prove the float is complete. Remember this access is provided by holding the horses jaw open and placing stress on the temporal mandibular joint. In addition, the upward head position artificially maintained during floating stresses the poll, occiput-atlas-axis joints. A chiropractic adjustment should be planned for a few days after the dental.